Christmas is coming to town and in the Northern Hemisphere many of us are still dreaming of a white Christmas, “just like the ones we used to know”. But how likely is it that our dreams will come true? What is the definition of a White Christmas ? Living in Western or Southern Europe, the Southern US or the Pacific coast of the US? Unlucky you! Not too surprisingly, most of the inhabitants of Portugal, Southern Spain, and Southern Italy have probably never experienced White Christmas in their hometown. 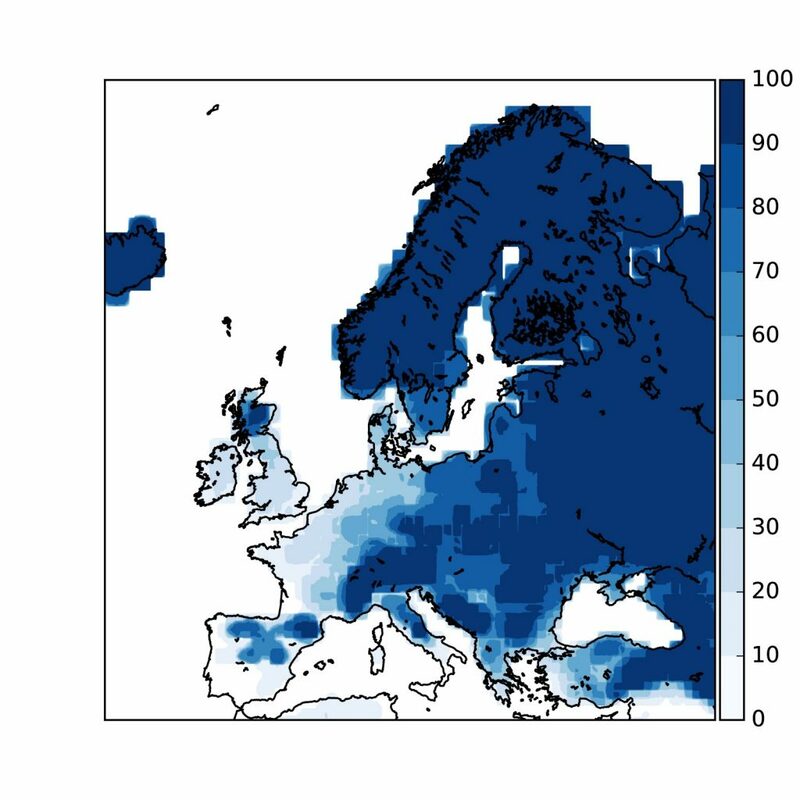 Maybe more counter intuitively the probability of a White Christmas is also low in most of France, the Netherlands, Ireland, and the Southern UK! 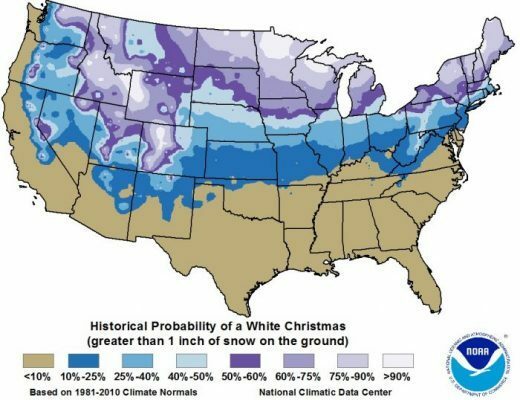 In the US, the probability of a White Christmas increases from South to North, except on the Pacific Coast, which has a very low probability of a White Christmas. What influences the probability of snowfall on Christmas? 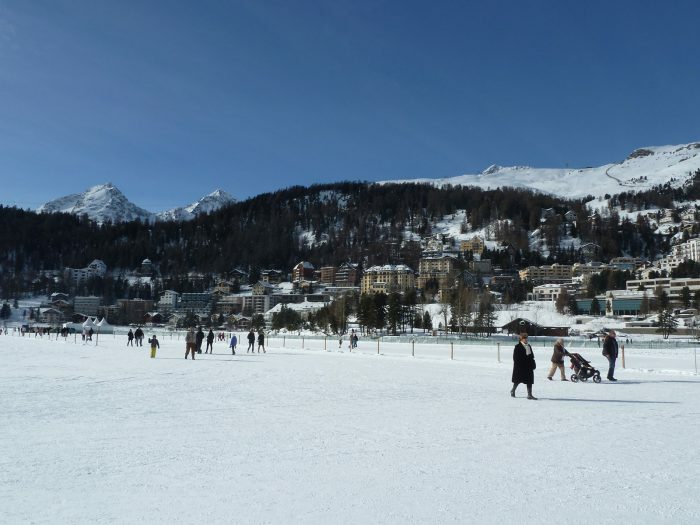 The mean air temperature decreases with altitude and latitude, meaning that chances of a white Christmas increase the further North and at the higher you travel. However, coastal regions represent an exception. The air often has traveled over the ocean before reaching land. As the ocean is often warmer than the land surface in winter, the air in coastal regions is often too warm for snow to form. Additionally, in the Northern Hemisphere, ocean currents on the Western coast of the continents tend to carry warm water to high latitudes, while ocean currents on the Eastern coast tend to carry cold water to low latitudes. The probability of snowfall is therefore even lower in Western coastal regions (e.g. Pacific coast of the US, Atlantic coast of Europe). Build your own snow with this simple recipe! We hope that you find a satisfactory solution that makes you happy this Christmas. Otherwise, remember that snow is not the only thing that defines Christmas. Enjoy the relaxed time with family and friends and prepare yourself for the coming new year! 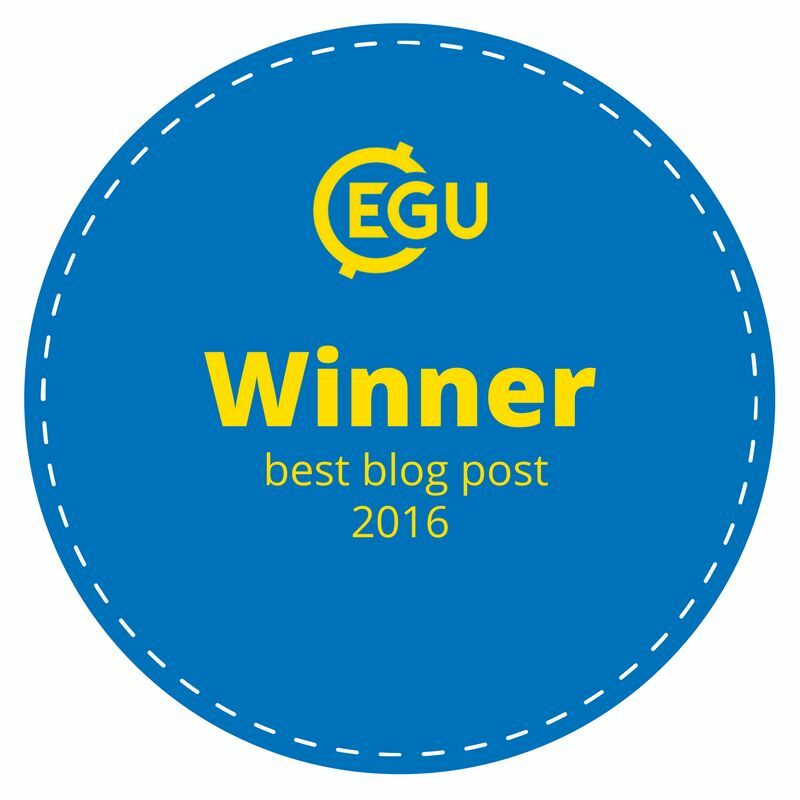 If you find yourself at a loose end, then there is always the back catalogue of EGU Cryosphere Blog posts to read – and we guarantee a healthy dose of snow and ice can be found here. 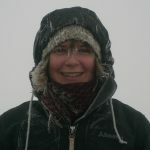 MetOffice website with interesting facts around White Christmas!